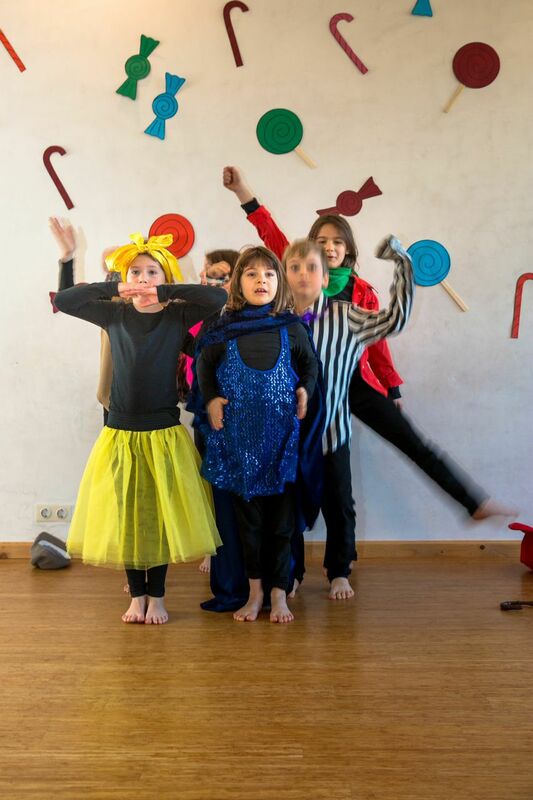 Drama skills, expression and confidence are developed through working on stories right from the first class through to the informal presentation for parents and friends at the end of the course. In the last course we worked on Charlie And The Chocolate Factory by Roald Dahl. The kids used scenes from the story as a basis for vocal and physical warm ups, acting games, learning text and working with props. To sign your daughter or son up for one of these courses, please fill in the form here. Your child’s place is only confirmed once we’ve received full payment. All kids are welcome to join – shyness or level of experience is not important. We do our best to encourage each child in a fun and relaxed manner and address each child’s individual needs. However concentration, commitment and the ability to work together with the rest of the group is important. If you know (or think) that your child has ADHD, Autism or another similar learning challenge, this course may not be a good fit for them. We ask you to kindly contact us in this case if you want to discuss individual queries.